GeoView Enterprise represents sophisticated server solution for collecting, sharing and publishing georeferenced imagery and videos. GeoView Enterprise edition enables running your corporate “cloud” solution for georeferenced imagery and video capturing, sharing and publishing. Leave security concerns behind, as your sensitive data stays behind your company’s firewall. It is you who decide how, what, where and when gets recorded, and which users and departments may gain access to recorded material. Manage and share data accross specified domain boundaries, or choose to publish over Internet via wide range of available services. Versatile GeoView Server API exposes both SOAP/WSDL and RESTful endpoints over transport of choice, be it HTTP or TCP/IP. This enables intergration with your existing solutions and building custom ones. GeoView Enterprise also comes with sophisticated Web Client application capable of recorded data viewing, sharing, management and more. 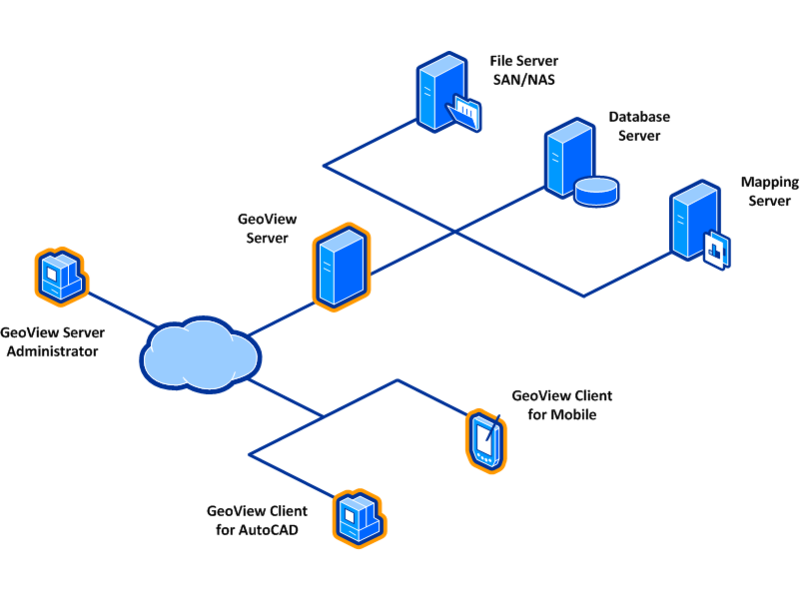 GeoView Server represents a core server application providing scalable, rich API support to it’s clients. It’s suitable for corporate environments or public services and agencies pubishing their georeferenced imagery and video recordings data over LAN, WAN and/or Internet. Multiple exposed endpoints enable various types of clients connect to a running server instance, authenticate, grab the data or inspect specific recording in details. Running as a system service, it provides both SOAP and REST API towards potential client applications – regardless of transport (HTTP/S, TCP/IP and others). GeoView Server also performs timed “data harvesting” upon uploaded recordings, classifying them where appropriate and storing them into a common feature data store (also accesible via GeoView Desktop edition). Thin client providing interactive map capable of displaying server-based photo and video recordings. Web Client application gives you a detailed, GIS-flavoured insight into georeferenced photo and video recordings stored on GeoView Server. Running either on your LAN/WAN or Internet, it provides on-line support for displaying, inspecting, editing, sharing and exporting data with your colleagues or general public. It will run on almost any device running a web browser. Also, it will enable users upload their photos and videos (with right credentials supplied), and get a report on total valid recordings put into use. Available recordings data can be easily shared with your peers, converted to multiple spatial reference systems, file formats, and more. Mobile client providing GeoView Server monitoring, customization and troubleshooting capabilities. GeoView Mobile Administrator app enables remote management of one or more GeoView Server instances. Easily monitor, customize and troubleshoot running server environment in real time while out of the office, using just about any smartphone device. Includes hardware monitoring (i.e. available RAM and HDD space), server configuration (endpoint host address and available APIs, data paths and processing schedules or web client settings), running server tasks (such as non-scheduled data processing or restarting server process), user and project management, access to server logs, and more. Mobile client enabling on-site imagery capturing and publishing onto GeoView Server. GeoView Mobile app helps users capture and share georeferenced imagery in the field using any GPS-enabled iOS or Android device. Use your phone or tablet camera to take photos and set required imagery meta-data when off-line. Mobile application records and uploads captured recordings to running GeoView Server instance once on-line, enabling you to share captured data with your friends and colleagues or analyse driving, cycling, or walking routes using the statistics recorded with each photo. Once uploaded to GeoView server, data is immediately available for publishing and consuming via GeoView Web Client and GeoView Desktop platforms. Register for free to gain access to GeoView Mobile and Web Client demo implementation. After successful registration we will send you an e-mail with map URL link, username and password needed for log-in. Demo map enables viewing existing recordings in a datastore, sharing recordings with your colleagues, or uploading new ones to a running instance of GeoView Server. Forgot your username or password? Please contact us. Copyright © 2014-2017 by GeoCrew bvba. All Rights Reserved.